That’s figs with an “F”. I bought some fresh figs the other day, and was searching the ‘net for some recipes. I came across a recipe for “Figs in a Blanket“. I loved the word play, and the recipe sounded good – sort of like Fig Newtons for grown-ups. But it called for fig preserves, so I tucked that idea away for later. How does that relate to monks? My dad and step-mother have been visiting, so on Monday we drove up to Huntsville to see the Shooting Star Saloon – the oldest continuously operating bar in Utah (est. 1879) – and the Abbey of Our Lady of Holy Trinity – the Trappist monastery. The monks used to be well known for the creamed honey they produced, as well as the home-made wheat bread (50 cents per loaf) that they sold at their gift shop. But time has taken its toll, and there are now only 13 monks left at the abbey – 11 of whom are over 80 years old. They no longer take novices, so I guess it won’t be long before the abbey closes. The abbey was founded in 1947. When the first monks arrived, the lodgings that were supposed to be built were non-existent, so the monks first lived in WWII barracks that had previously housed POWs. 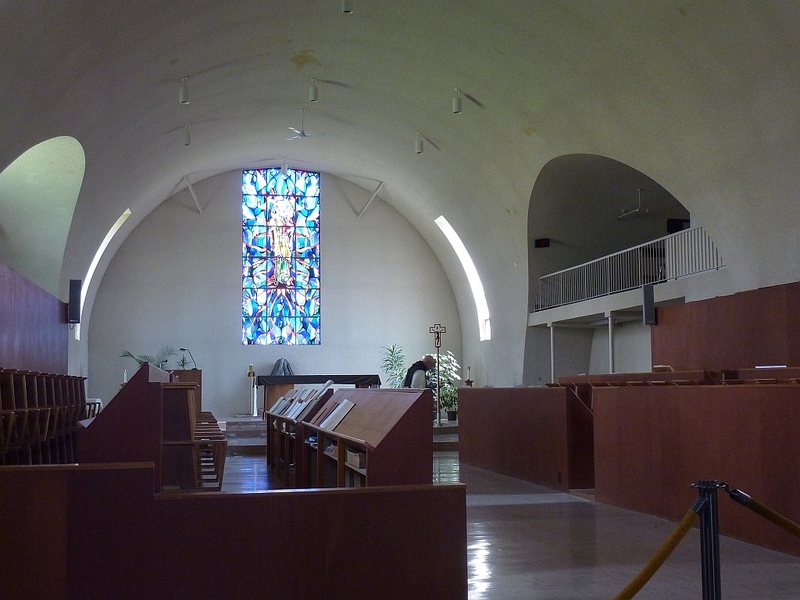 The abbey was built from military-surplus Quonset huts, with the intent of replacing them later with new buildings. But that never happened, so the Quonset huts remain. The monks now lease their land, and don’t produce the honey or bread any more. Father Patrick, who runs the gift shop, said “We didn’t run out of bees, we ran out of monks.” However, they do sell preserves and candies made by other Trappist monks and nuns. When I saw the jar of fig preserves, I knew I had to buy it. Father Patrick was a hoot, and it was really fun talking to him about the history of the abbey. I asked him if he’d been there from the beginning, and he said that he came in 1950 and had never left the abbey. He also told us that the monks would be praying None (midafternoon prayer) in a few minutes, and that we were welcome to stay to listen to the monks sing. And so we did. The church, of course, is quite plain (hard to dress up that military construction), but has a beautiful stained glass window. 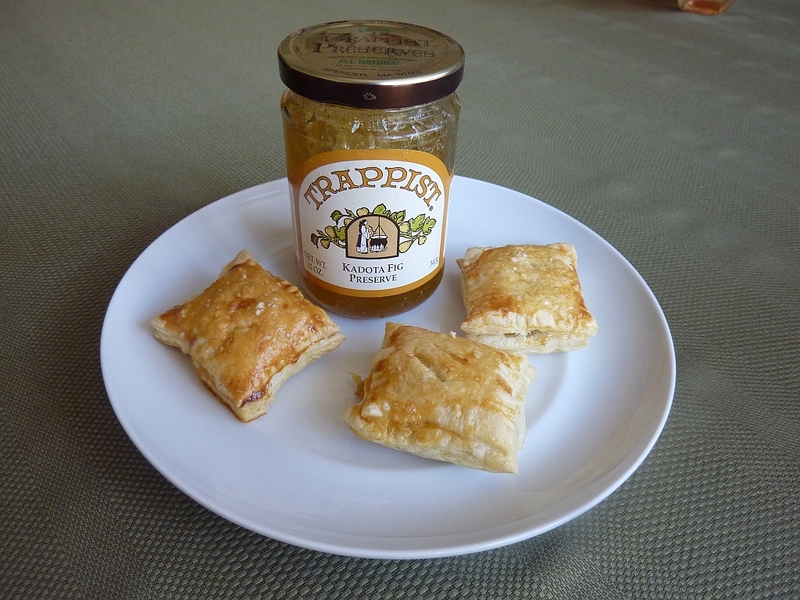 So as for those fig preserves… are now my Trappist Figs in a Blanket. Please note that the recipe I linked to has an error. It calls for one sheet of puff pastry, but it really should call for two. Each sheet is cut into 25 squares, and you use 2 squares per pastry (a top and a bottom). If you only have one sheet, you’ll end up with 12 pastries plus an extra square, instead of the 24 it’s supposed to make. I just used one sheet, since I didn’t need that many anyway. It’s an easy recipe that would be good with pretty much any kind of preserves. You might want to sprinkle a little sugar on the top instead of sea salt, depending on your choice. This entry was posted in Uncategorized and tagged entertainment, Food, Utah. Bookmark the permalink. Sounds like a really interesting visit. On a related note, the library where I am director is a beautiful building now but was originally a Quonset hut. That did not make for a great facility for a library, as you can imagine. I’m salivating! Fig preserves are a favorite of mine. I guess, I’d better get up to the Abbey before it closes! What a wonderful story and lovely looking figs in a blanket! Serendipity, for sure! I love fig preserves . . . and those figs in a blanket look divine! What a great story, Cheryl.